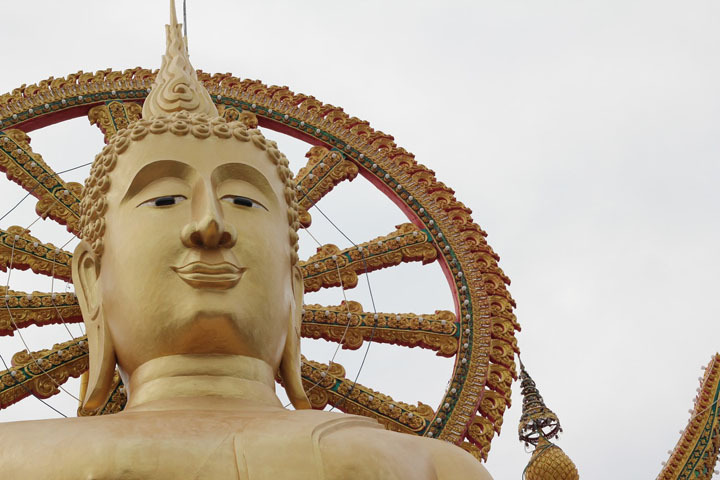 I am still going through and re-editing photos from my trip to Thailand, and today's one comes from our trip to Big Buddha on Koh Samui. It was our first day on the island and it had been an exhausting 14 hour trip to get there, but we were not about to give in and go to sleep! Instead we decided to see one of the sights and do a little shopping while we were at it. This was the original photograph. The sky was overly cloudy and did not make for a particularly appealing backdrop, drowning out the colour and leaving the image rather bland. The Big Buddha himself was dull and lifeless and not at all the Buddha that I remember him to be. This is the first edit using Picasa. You can see that the colour was rendered rather well with the backdrop becoming white, which (to be fair) isn't necessarily a bad thing in my opinion. It was a bad day for photo taking, but the blown out aspect does not extend to the statue itself and works to bring the Statue to the main point of focus. I do find the two objects on the bottom right of the picture to be distracting as is the pole coming up behind Buddha's head. And this is the final edit done in Photoshop. The colour is not quite as bright as it was in Picasa, but this is intentional. This is more the colour that the actual statue was rather than the overstated gold that came out from the Picasa image. I was also able to use Photoshop to edit out the parts of the image that I found to be distracting. This was done very simply with a clone tool to clone the white area towards the top of the screen and to the right of the pole by Buddah's head and carefully place the white over the areas that I found to be distracting, leaving a clean image of Buddha over the white background. Had I not been there myself, I would not have known that this was the skyline. This may make the image seem overly fake or generic, but I feel that considering the circumstances of the weather, it was the best that could be done in this instance.